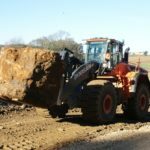 The DL580-5 carries huge 14-16 tonne blocks of Ironstone from the quarry face to a new £1 million stone processing plant that has recently begun production at the top of the quarry. Great Tew Ironstone has a striking brown and blue vein and is only available from this Oxfordshire quarry. The quarried block is often up to 30 tonne, which opens up a wide variety of uses, including building and walling stone, architectural details, mullion windows, copings, quoins and flooring. Smaller quarried block is suitable for rockery stone and one-off garden features. The quarry lies on the historic Great Tew Estate, which always quarried block for its own use and in 2000, the quarry was opened further to satisfy a wider demand for this unique product. Great Tew is part of Johnston Quarry Group, the largest supplier of quarried and mined block stone in southern England. 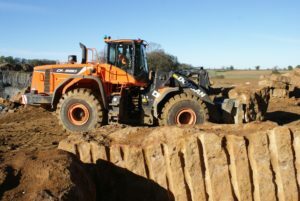 As well as Great Tew, the Group owns and operates Sarsden Quarry in Oxfordshire, Creeton Quarry and Ropsley Quarry both in Lincolnshire and Oathill Quarry in Gloucestershire. The Group also runs three Bath stone mines. With the wide choice of building stone and masonry products available, the Group supplies over 60,000 tonne of stone block and 300,000 tonne of aggregates per year. Equipped with specially matched pallet tines, the DL580-5 brings the large blocks from the base of the quarry to the top and along a short road, at the end of which it loads them on to the sawing machines in the processing plant. 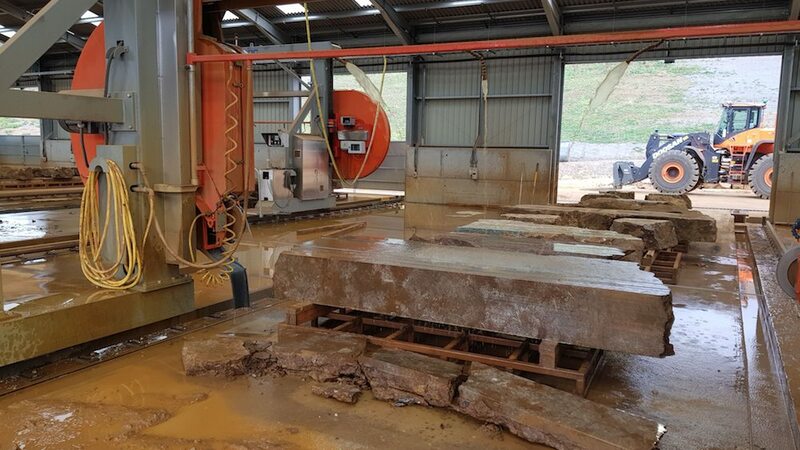 Previously, the quarry was only able to move blocks weighing up to a maximum of 10 tonne, so the arrival of the DL580-5 has made this a much more efficient process. To take on heavy material handling jobs like this, the DL580-5 features robust structural components and an advanced double circuit axle cooling system. That makes the unit ideal not only for block lifting in quarries and mines, but also heavy-duty applications in industrial, construction and recycling operations. The overall size of the DL580-5 is almost the same as the DL550-5, the next model down in the Doosan range, but it has an operating weight of 36,030 kg, and higher static tipping loads (straight/full turn 40°) of 29,700 and 26,200 kg, respectively. In addition, the new model is equipped with a series of features that make the machine extremely reliable and durable. For example, the front structure is more rugged, with greater rigidity and strength. The DL580-5 has reinforced Z-bar kinematics for heavier lifting with few moving parts. This design also helps stabilise the loader, enables rapid bucket movements and keeps the bucket at the right angle position at all times. 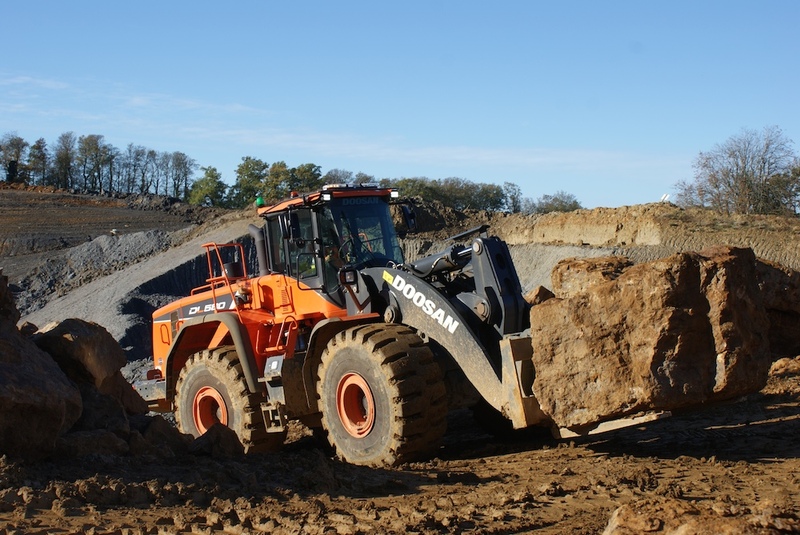 The DL580-5 was supplied by Doosan dealer, Filtermech Plant Sales, based in Wakefield in West Yorkshire, in conjunction with another DL580-5 supplied last year to Creeton Quarry. Filtermech provides back-up for the DL580-5 along with the other Doosan wheel loaders, crawler excavators and articulated dump trucks at Creeton but the DL580-5 and the other Doosan machines at Great Tew are supported by Murley Construction, another Doosan dealer, based more locally at Stourport-on-Severn. The DL580-5 is powered by the Scania DC13 6-cylinder engine producing 283 kW (380 HP) of power at 1800 rpm. Providing a generous maximum torque of 1765 Nm at 1300 rpm, up to a 10 per cent reduction in fuel consumption and excellent response, the Scania DC13 engine meets Stage IV emission regulations without the need of a diesel particulate filter (DPF), through the use of cooled exhaust gas recirculation (EGR) and selective catalyst reduction (SCR) after-treatment technologies. The engine Auto Idle system when activated saves further on fuel costs by lowering the idle level from 950 to 750 rpm – when the operator does not give any input to the steering wheel, arm and bucket for more than 10 seconds (ideal for applications where there is a lot of waiting time such as truck loading which can be up to 8 per cent of the time). In a further fuel saving feature, the Engine Auto Shut Off shuts down the machine after it has been idling for a specified amount of time (3-60 minutes, configurable by the operator via the control panel). As well as the powerful Scania DC13 Stage IV engine, the DL580-5 also features automatic 5-speed powershift transmission, heavy duty cooled axles, a high comfort cab, smooth and responsive hydraulics and auxiliary hydraulic connections. The ROPS/FOPS cab demonstrates how Doosan has placed operator comfort at the very centre of its design priorities. Offering generous headroom and an ultra-comfortable, fully adjustable, heated Grammer air suspension seat, the DL580-5 cab features a novel steering column design giving more clearance for the operator’s legs and knees. The steering wheel can also be tilted and moved telescopically to match the operator’s preferred position. Electric joystick steering is incorporated to ensure operator driving comfort and improve productivity. The 5.7in. full colour LCD panel is suitable for day and night work. The user-friendly monitor has two customisable screen displays to suit the operator’s preference, giving a full read-out of machine settings and maintenance data. The rear-view camera greatly enhances visibility and safety. The screen in the cab shows the operator what the camera sees and includes several lines to help judge distances; it also has other functions, including light intensity control, viewing angle control, language setting and power on/off setting.